I have taken three months off from blogging here. During this time, we welcomed our fourth grandchild this summer. We are also helping the great - grandparents as they pack up and get ready to move south (They lived here with us for 9 years). Things are changing at our Vermont Estate. I have had temporary access to Internet this past week. I wanted to let you know that a new book has just been published. I wrote it as I was helping take care of my grandchildren. I have been remembering all the things we did when our own children were little, and what life was like a generation ago. I have also noticed the doctors and nurses were doing some new theories, etc. both in the hospital at birth and at regular doctor visits. It seems theories on baby and child care change with the modern generations. I wanted to put the "old thoughts" in writing to help the coming generation of mothers. I put together a small little book, "Old Fashioned Motherhood." It is a short, but peaceful read that will encourage the Christian mother who is taking care of babies and small children. It has little bits of advice on a variety of topics. This is a small, 62 page, plain, paperback book with a simple cover. It was written as I sat in a rocking chair by the parlour window, rocking one of my grandbabies. I hope it will encourage you. I would love your help in getting the word out about my new book. I am very grateful for your support and encouragement! "I have enjoyed all of Mrs. White's books and find her advice on caring for the home and family to be incredibly helpful and inspiring!" "I enjoyed this great little book. Nice gift for a new family." - Little Blessings, from Amazon. 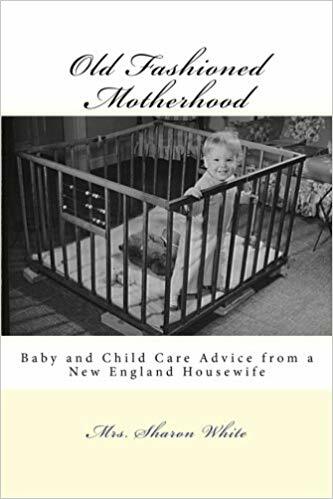 "Old Fashioned Motherhood: Baby and Child Care Advice from a New England Housewife" is available on Amazon. I don't have much time online, but will be available for a few more days. This will be the last post for quite some time. For those who are interested, I am writing a small monthly newsletter and sending this out by regular mail. It is free to subscribe. I only ask for a self-addressed-stamped envelope to make it easy for me, both financially and in the saving of time. You would just need to email me to request my personal address. Please find the details on our publishing blog.. Writing this post is making me realize how incredibly time consuming blogging can be. (gentle smiles.) Two of my grandbabies are here and they have just gone to bed. I have some tidying to do and then I will get my rest. I hope you are well. God bless you and your families! Getting the Children's Help - Nobody Wants to Clean a Messy House. Poverty and Peace - Living without Credit Cards. A Beautiful way to Live - Simplicity of Old Fashioned Homemaking. I've missed you, Mrs. White. I am so sorry that I haven't written. My husband opened a restaurant at the Precious Moments Chapel in Carthage, MO. He has kept me busy helping him in addition to my usual duties. I do hope to write one day. I don't wish to lose touch. Have a wonderful Autumn. It's my favorite time of year! I shared this post on several social media sites. I hope you get a lot of sales. I am so glad to see you posting and publishing! I have been ordering your books through my library's Zip Books program so I don't get to keep them, but I do get to share them with my neighbours while staying true to our thrifty values. Much respect and best wishes to you and your family. I have missed you and so enjoy reading your blog. So glad to get this update from you! My Husband has been away for work since May and I have been quite busy with the four littles! I did just finally order your books, and can't wait to get them. Be blessed and know that you will be missed and are very much appreciated. You are doing the right thing! I would love to get your snail mail newsletter Mrs. White, but I live in Canada so the mailing wouldn't really work. I appreciate all the time you have devoted to encouraging us mothers in our calling. Thank you, and God bless you and yours. Lovely to see your post Mrs White. I am back blogging on www.heartforhome-making.blogspot.com and I know how much time it takes up! I wish you all the best with your new book. I know that mothers and grandmothers of little ones will love it.